It was the Tony Awards. Now I had no idea what the Tony Awards were, but I casually found it, tuned in and ended up nearly wetting myself. There, on my downstairs television, was actual live footage of that year's Best Musical nominee Beauty and the Beast. I was floored. Up until that point, the Broadway production of Beauty and the Beast was something that only existed on the Original Cast Album that my parents bought for me at the Disney Store two hours away. The only other things I remember from that first Tonys viewing were a redhead from the revival of Damn Yankees belting out "Shoeless Joe from Hannibal MO," and the look on my father's face when I correctly predicted that Diana Rigg would win for portraying the title role in Medea. Said the young JSP: "Come on Dad. I mean, it's Medea." Thus began the creation of my most important Sunday of the year besides Easter. And even then, Tony Night is basically a religious experience, so I never felt bad. Every year I instructed my family not to interrupt me during the Tonys because I had to record it on the VCR with controller in hand to avoid commercial breaks. This was essential to the Tony viewing process since I'd be re-watching the broadcast countless times before the following year. This continued even when I was serving as an LDS missionary. My mom stepped in and vicariously watched the show for me in 2001 and 2002 since I was not able to watch them myself. She not only recorded them, but took copious notes on their proceedings and sent them to me in far away west Texas. 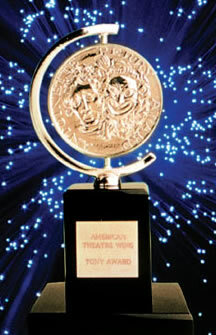 So from a true theatre nerd to all those out there that might feel the same, Happy Tony Night!